It's been nearly a month now since John Foyston broke the news that Roots Organic Brewing was closing for good. Instead of blurting out the first thing that came to mind, I've been gathering up my thoughts and memories, and now I'll blurt out what comes to mind a month late. I have mixed emotions about Roots closing -- it was for a time my favorite pub in town, but we've been drifting apart for a couple of years now. When Roots came on the scene in 2005 it was like a breath of fresh air. As soon as they opened, you could find their beer on tap at nearly a hundred places in Portland. The hoppy, muscular Woody IPA and Island Red were instant winners, and if you didn't care for those, they had two very good hopless beers -- the Burghead Heather and the Gruit Kolsch. We soon switched our neighborhood pub night from Mondays at the Lucky Lab to Tuesdays at Roots. It was more crowded, with little outside seating and terrible feng shui indoors, but the beer was better -- the Lucky Lab was in a slump that it has since recovered from -- and priced to sell at $2.50 for an imperial pint. The beer seemed to keep getting better and better: the Sharkbite Imperial IPA was smashing, then winter came and the powerful double-red Festivus came out, followed by the eye-popping, smoky, hint-of-cherry, completely insane 14% concoction known as Epic. What happened? Sometime in 2007 or 2008 Roots seemed to lose its momentum. Their tap-handles vanished all over town, apparently because of a feud with their distributor -- note to small breweries: a feud with your distributor is going to go about as well for you as a feud with my wife goes for me. The quality of the beers went down -- even non-jaded out-of-town guests were puzzled when I insisted on bringing them to Roots. 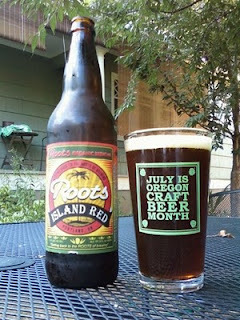 The bottle of Island Red pictured above -- bought at Belmont Station a day after Roots closed -- was perfectly bland. There were exceptions: Calypso, their 2008 OBF beer brewed with apricots and habaneros was brilliant; the Flanders Red (released in 2009 but two years in the making) was an impressive feat if you like that sort of thing. Maybe it was the competition. Beeronomics guy Patrick Emerson says it's only natural for some beloved businesses to fail, and that it's a sign of a healthy economy. Remember, when Roots arrived, there was no Ninkasi and no Hopworks. When those two breweries started up, they brought their own burly IPAs, plus Ninkasi offered a beautiful NW Red and Hopworks offered an entry-level lager to compete with Roots' Heather. Now Hopworks and Ninkasi tap handles are all over town, following the trail blazed by Roots. The pub itself had competition also: down the street the Green Dragon opened in 2007, and by 2008 had started regular meet-the-brewer nights on Tuesdays, grabbing some of Roots' pint-night business. Hopworks probably drew some of the Roots crowd away to its cleaner, fancier digs. And Roots didn't do itself any favors with its disastrous attempt to be open for lunch -- I was so annoyed by a couple of my lunch visits that it put me off visiting at other times. It's worth noting Ezra's report of financial shenanigans at the Roots-affiliated NAOBF, though it's hard to say whether this was a symptom of problems at Roots, or two symptoms of the same lack of business acumen. For better or worse, it's over now. It was a meteoric rise, a fun ride, and a long decline. I'll remember the good times. The cycle continues, let's see what happens next. Nice post. Just to be clear: it is a sign I think of a very healthy beer scene and local craft beer industry. The economy - well that is still shite. Absolutely hit it on the head, Bill. Kudos. Nice job, Bill. I think you nailed it. Was I was the only guy in Portland who liked their lunch? When I worked over there I would go about every other week. Gonna miss my holiday Epic every year. Still have a couple magnums from 06 and 07. Bill, I moved here in the summer of 2007 which seems to be right at the beginning of Roots' decline according to your post. Maybe that explains why I never understood the love for Roots. I tried more than a few times to find a beer I liked from Roots. The only one I ever thought highly of was one of their fresh hop beers - Hopopotamus. Other than that it was all misses for me (granted I never took the plunge on the Epic after so many misses). I didn't bat an eye when I heard they closed. I wish all involved well in the future. the food at roots was diabolical. IMHO, that was one of the major reasons they closed.